Everyone loves a clown and this month's Cherished Teddy is no exception! Stitch Count: 90H x 54W. Stitched on 14 ct Antique white or 28 ct cream linen using DMC floss. Complete kit includes 12 Ct. Off White Aida, chart, thread, needle, and instructions. Finished size: 21.2" x 8.6". 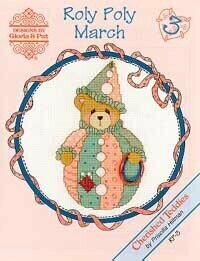 Complete kit includes 12 Ct. Off White Aida, chart, thread, needle, and instructions. Finished size: 24" x 8.8".